More than any other campaign of WWII, Operation Weserubing has been shrouded in mystery. Strategic political and legal issues were unclear and military issues were dominated by risk. The German success was the result of improvisation and the application of available forces far beyond the comprehension of their British and Norwegian counterparts. The operation necessitated combining the resources of air force, army and navy. Troops were transported into battle by warship and aircraft, and paratroopers were used for the first time. This combined arms assault was the first ‘three dimensional’ strategic invasion in history. 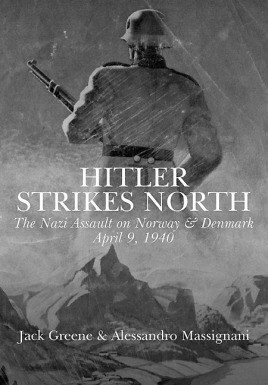 Hitler Strikes North details the course of this groundbreaking invasion and provides valuable historical and modern lessons about the role of combined arms planning, the strategic demand for resources, and the use of military force. Jack Greene is an author and historian. Alessandro Massignani is an author and historian.